One month ago today, those of us in NYC and the surrounding area were hunkering down and riding out a storm named Sandy. As conditions worsened and disruptions in communications technologies multiplied, people did something they don't often do en masse anymore: they turned to radio to find out what was going on. A few radio stations did provide an informational and emotional lifeline, demonstrating that the medium still has an important role to play in our modern media environment. The ubiquity of broadcasting, coupled with the ease of access to it (no device necessary save for a cheap receiver, no contracts, no terms of service) made radio the go-to medium after almost everything else stopped working. Broadcasters are trumpeting this in the context of a policy initiative they'd desperately like to see: a government mandate for radio reception in mobile phones. With the benefit of storm experience, I can better understand the rationale behind this notion. But still can't bring myself to support the idea, for two primary reasons. The first involves the lionization of smartphones. Yes, they can do many different things, and that is pretty neat. But the navigation of life does not occur through a single piece of technology. Smartphones are complicated devices, with many potential points of failure. A standard AM/FM radio receiver, on the other hand, is not. You can't find cheap, disposable batteries sold in bulk for a smartphone. While it is true that many people don't buy radios anymore - they buy devices that happen to have radios in them - it doesn't obviate the need or desire for a stand-alone receiver. Also note that any receiver mandate for smartphones only covers FM: the electrically-noisy environment inside such devices makes AM reception questionable at best. While many smartphones already have the chipset in them for FM reception, it's a bit more complicated than installing an app to access this functionality. The chip must be wired to the "antenna" (i.e., the connection for your headphones or earbuds, without which a radio app won't work) and the phone's firmware must be programmed/updated to utilize the functionality. It's this "hidden cost" which is at the center of the consumer electronics industry's opposition to a radio reception mandate. But my second concern is the larger one: a Sandy-hyped mandate for FM compatibility might be used as a stalking horse to impose HD Radio reception technology in phones. Heaven knows the technology could use the boost: iBiquity Digital Corporation recently announced that the number of HD Radios sold in the United States finally cracked the 10 million mark - reaching a 1% penetration rate a full 10 years after the technology was first introduced. The increase is wholly due to the automotive market, where some manufacturers have added HD functionality to their in-dash entertainment systems. Considering the general ignorance of policymakers (especially Congress) regarding how communications technologies actually work, it's an expensive and convoluted (but crafty way) of using "market incentives" to get broadcasters to adopt HD. The FCC made its deployment optional precisely because the technology is proprietary. Whereas adding analog FM reception functionality to a smartphone represents a pennies-per-unit cost, the chipset and software necessary for HD reception resultingly costs much more. In this instance, a mandate effectively represents a tax that enriches a proprietary business model. Imagine the outcry if the government mandated the use of Windows over Apple (or vice versa) in an everyday device. Once a mandate for analog FM is established, the political hurdle for an HD mandate is much lower, because ignorant policymakers don't understand the difference between analog and digital radio and subscribe to the popular fallacy that digital always equals "better." It's still quite likely that the political and economic recalcitrance of the consumer electronics industry will carry the day, aided by modern America's inability to remember much of anything outside of the recent past. The sad thing is, such disaster opportunism is likely to become more frequent as climate change becomes more severe. Bloch was one of those rare and lucky folks for whom activism was a full-time vocation. After working with Greenpeace throughout the 1980s, he created the Wetlands Preserve in New York City in 1989. The nightclub became a magnet for many bands that rose to fame out of the "alternative" music soup of the 1990s. After the station was raided in June of 2003, it promptly returned to the air and launched an unprecedented campaign to document its community support. 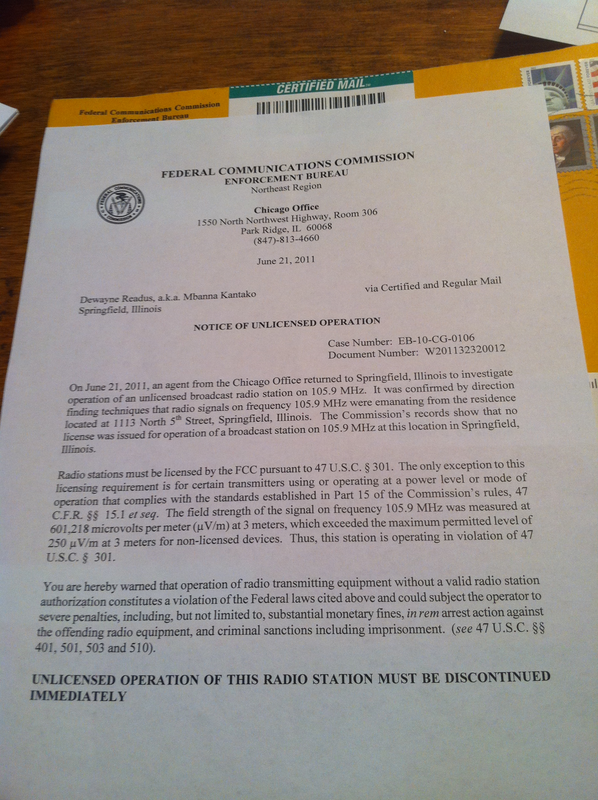 This resulted in the passage of a referendum by which the citizens of the town granted their own authorization for rfb's continued existence until such time as the FCC would give the community an LPFM license. The FCC countered with a request for a court injunction to bar radio free brattleboro from broadcasting. This request was initially denied by a federal District Court judge, who was swayed enough by the station's demonstrable support to press the FCC for a more detailed justification to silence them. Bloch was instrumental in organizing the station's defense. This deferral allowed radio free brattleboro to continue operating until June of 2005, when the station was raided again by the FCC. Ironically, just three months before this raid, a group called Vermont Earth Works was awarded an LPFM construction permit and the process began to build out the "legitimate" station. Mission accomplished. As the direct descendant of radio free brattleboro, WVEW-LP features the sort of diversity to which all LPFM stations should aspire. Bloch held down a Tuesday evening slot, during which he would often play tapes from shows at the Wetlands, maxing out WVEW's online stream capacity in the process. Between rfb and WVEW, Bloch spent some 14 years on Brattleboro's airwaves, and his work in this particular arena stands to be his longest-lasting legacy. WVEW is planning a tribute broadcast to air in Bloch's old time-slot, the date still to be determined. WTRA would later be re-named Human Rights Radio to reflect the Kantako family's widening concern with issues of social injustice. HRR is widely cited as sparking the modern microradio movement in the United States - an occupation of the airwaves that sought to speak truth to power at both the neighborhood and national levels. In response to this uprising, The FCC created the LPFM service, which itself turns 12 this year. As a popular phenomenon microradio remains alive and well, considering how hard the FCC struggles to knock it back. In the last quarter-century, agents have visited, fined, and raided Human Rights Radio, most recently in June of last year. (Kantako's famous for taping and broadcasting his righteous encounters with the law. 2011 found him berating field agent Will Gray about allegations that HRR was "knocking airplanes out of the sky.") A federal court has even enjoined Kantako - now north of 50 years old - from broadcasting, yet he remains undaunted. Today, Human Rights Radio serves as the anchor for a bevy of after-school education programs devoted to Springfield's underprivileged youth. And the station can now be heard globally, thanks to streaming. The legacy of Human Rights Radio reaches far beyond the Reagan era of its birth, not to mention the FM dial. Quite a touchstone to the power of political fortitude. This crowdsourced funding call to build a new community radio station crossed my tweet-stream Tuesday. The Media Institute for Social Change, a non-profit media literacy/empowerment group in Portland, Oregon, has apparently secured a "rare opportunity" to build a new radio station in town. The goal of its campaign is to raise $3,500 by November 16. As of today, $2,220 has been pledged. By no means does this amount reflect the real costs of starting a station, but we have (as they say) friends in the business who are providing equipment and services at greatly reduced rates; no, not free, but at a fraction market-value." It costs more than $3,500 to build out a low-power FM radio station - but the FCC hasn't given out new licenses for those in years (this is likely to change in 2013). Building out a full-power station is even more expensive. I couldn't find an FM station construction permit for the Media Institute for Social Change in the FCC's database (though my mining-skills are admittedly rusty), but I did find records about the organization's plan to purchase a 28-watt FM translator in Nehalem, Oregon - some 80 miles from Portland - for $10,000, filed in August. The seller was the Educational Media Foundation, a significant participant in the 2003 Great Translator Invasion - an event best known its rash of speculative filings for translators. Spectrum scarcity makes for strange bedfellows. There've been more developments regarding the radio industry's potential plans for "modernizing" the AM band. Radio World reported last month that the NAB's Radio Technology Committee and CBS have selected an unnamed AM station "in an area that could be characterized as a medium-sized market" to be a guinea pig for all-digital AM-HD Radio test broadcasts. This is the first of "three or four" AM stations that may be tapped to test the all-digital protocol. The experiments are likely to be done by an "outside engineering contractor" and primarily financed by HD's developer, iBiquity Digital Corporation. They could begin before the end of the year. This is but one option for the future of AM broadcasting detailed in a confidential report produced by the NAB - a report that is unlikely to ever see the light of day. The trade group justifies the secrecy by characterizing the report as "extremely technical and would need to be explained and/or possibly watered down for consumption by non-engineers." Furthermore, meetings on this issue will remain closed to the public, for if they were open, "no one would feel free to participate and no work would be accomplished," according to a Radio World source. Meanwhile, Republican FCC Commissioner Ajit Pai delivered a keynote address at the annual NAB Radio Show, held in Dallas in September, in which he mentioned the dilemma of AM broadcasting in the U.S. He's met with broadcasters more than two dozen times since he took office in May. Most notably, Pai called for the creation of an "AM Revitalization Committee" at the FCC. In addition to a comprehensive review of AM broadcast rules, Pai suggested a year-long timetable for deciding the future of AM, calling for a plan of action by "early 2014." Pai is a neoliberal fundamentalist who believes regulation in and of itself is a scourge that inhibits the functioning of the "free market." Thus it's not surprising that he believes the FCC's role is to assist broadcasters in whatever plans they have for the future of AM, as opposed to facilitating the thinking about and implementation of solutions. This is a dangerous paradigm, but unfortunately it reflects the modus operandi of contemporary broadcast policymaking at the FCC. One need look no further than the development and deployment of HD Radio itself. The technology was developed mostly in secret by broadcast-investors, who refused to take into consideration the larger concerns of their industry as a whole. By the time development and testing had been completed, and the FCC was petitioned to adopt the standard, most broadcasters (in the individual, flesh-and-blood sense) had no idea how functional HD Radio really might be, and many who did have some foreknowledge were skeptical. As the record shows, this lack of transparency during HD's development poisoned the policymaking environment and trade press. There was massive consternation among independent (i.e., non-iBiquity investor) broadcasters and the public about HD's fundamental viability, not to mention its profound effects on the future potentiality of digital radio broadcasting itself. However, by that point the FCC had already effectively made up its mind on HD by opting out of any active role in the technology's development and plans for rollout. The FCC's calculus for making this constitutive decision was simple: a small group of companies that controlled the vast majority of the radio industry's revenue supported the technology, as did NPR. If the largest political and economic players in the world of radio broadcasting, both commercial and noncommercial, thought it was good, it must be good for everyone. As we have seen over the last ten years, this assumption was incorrect. Broadcaster and listener indifference/resistance to HD Radio would seem to suggest that responsibly formative media policy cannot be made in a neoliberal vacuum. Yet more of the same will likely decide the fate of the mediumwave band. It will be another fait accompli: the NAB and the nation's largest corporate AM broadcasters will do "careful and thorough research" on the future of AM. NPR will sign on because it's desperate to not be marginalized. Their "carefully vetted" conclusions which are "too complicated" for anyone but them to validate will be duly accepted by the FCC. Any public deliberation of the issue - inside the regulatory sphere or otherwise - will be garnish to provide the patina of due process to decisions that are being made now, to which all broadcasters and listeners should have a part. Commissioner Pai's call for an "AM Radio Revitalization Initiative" suggests the skids are already well-greased. The FCC's role in crafting the future of AM is to get out of the way. Pai suggested the Initiative be guided by "one basic question: are there regulatory barriers we can remove to help this sector rebound?" Calls for the widespread dismantling of regulation is neoliberal code for "let the marketplace decide." If Pai and the FCC continue to mistake their conception of "the marketplace" as representative of everyone affected by the future of AM, the outcome of this important process will be suboptimal to say the least. The key to avoiding this outcome is transparency. The NAB should release its report and Pai should make sure future deliberations take into proper account of the perspectives of all constituencies, regardless of their political and economic weight in the discussion. Making good policy on the future of AM radio calls for no less.